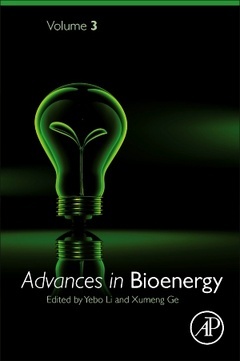 Advances in Bioenergy, Volume Three is a new series that provides both principles and recent developments in various kinds of bioenergy technologies, including feedstock development, conversion technologies, energy and economics, and environmental analysis. The series uniquely provides the fundamentals of the technologies, along with reviews that will be invaluable for students. The audience includes researchers, students, industry and governmental regulators and policy makers. Dr. Yebo Li is a professor in the Department of Food, Agricultural and Biological Engineering, The Ohio State University (OSU). His research area is bioproducts and bioenergy with focuses on biogas production and upgrading, fermentation and separation, and thermochemical conversion of biomass for the production of biopolyols and polyurethanes. Dr. Li has written more than 230 peer reviewed journal articles and conference presentations and been awarded five patents. He has served as Division Editor, Associate Editor, and sat on Editorial Boards for several journals like Transactions of ASABE, and International Journal of Agricultural and Biological Engineering, Environmental Progress & Sustainable Energy. He is also the Co-Editor of a bioenergy textbook: Bioenergy-Principals and Applications . Dr Li has received many awards including the 2012 Rain Bird Engineering Concept of the Year Award from the American Society for Agricultural and Biological Engineers. Xumeng Ge works at Ohio State University.